C# Linear UPC-E Barcode Creator DLL is a multifunctional C#.NET barcode SDK, which can not only help C# developers create & add standard UPC-E barcode on source document or image file but also allow developers to customize created UPC-E barcode as an independent image object on target file using Visual C# code. Here we provide a brief benefit list of this C#.NET UPC-E barcode generator library control. You can easily generator UPC-E barcode and save it to image files/object using this C#.NET barcode generator control. The following steps will show how to create a UPC-E type barcode encoding numeric data text "012345" into the image object with XImage.Barcode.Creator. Please copy the sample code as follow to generator a UPC-A barcode. 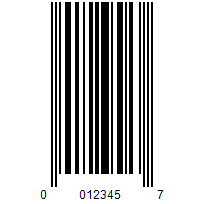 As mentioned above, RasterEdge UPC-E C# barcode creator DLL can generate UPC-E barcode and draw created UPC-E on BMP, PNG, GIF, JPEG image files. Here we offer a C# programming example to explain how to draw standard UPC-E barcode on a PNG image file. Here, we offer some C# codes for you to have a better understanding of UPC-E barcode creation and insertion on source document files, including PDF, TIFF, Word, Excel and PowerPoint. The sample C# code below aims to illustrate how to create and insert a fully user-customized UPC-E barcode on target image file using C#.NET programming method.